It’s gonna be a horrible night to have a curse, folks. Below you’ll find what we deem to be the best sci-fi and fantasy movies and TV coming to Netflix, Amazon, and Hulu in October. A lot of it is thematically spooky, unsurprisingly! Get ready to see the famous Teenage Witch like you’ve never seen her before. The Shining—Stanley Kubrick’s iconic adaptation of Stephen King does not need another exultation of its masterful craft, but hey, if you wanna get caught up before the Doctor Sleep movie (and the zillion other King projects in the works) starts ramping up production, now you can! Blade and Blade II—Wesley Snipes seemingly can’t stop saying he’s interested in doing a new Blade now that Marvel is ruling the roost at the box office, but while we wait for more vampire-slaying daywalker goodness, regardless of the form it takes, look no further than the movies that helped really kick off the revival of Marvel superhero success at the box office. of Alan Moore’s classic comics work, but alternate-dystopian Britains wait for no man. Except, well, one in a mask. Truth or Dare—Okay, so admittedly the vast majority of this recent Blumhouse release—about a killer, sentient game of Truth or Dare—is really bad. But it has a frankly absurd twist ending that we loved, to the point of almost making it worth streaming once under some kind of inebriated stupor. Apostle—Dan Stevens takes a break from traversing the weirdest psychic mindscapes around on Legion to be put through the ringer in this intense Gareth Evans film, as a man trying to rescue his sister from a weird religious cult living in a seemingly utopian island society. Surprise: it’s not utopian in the slightest! The Haunting of Hill House—This series adapting Shirley Jackson’s 1959 novel about a family returning to their seemingly haunted childhood home looks bleak as hell, and we can’t wait to see more of it. Daredevil Season 3—Matt Murdock is back after his not-so-seeming death at the climax of The Defenders, but it seems like getting a building dropped on him and having is his dead ninja lover show up as a brainwashed villain (god, these Marvel Netflix shows have really gone places since they started, haven’t they?) has done nothing to improve Matt’s dour mood or his crippling Catholic guilt. Expect the devil to be unleashed against a very familiar-looking foe this time around, as the Kingpin of Crime returns. 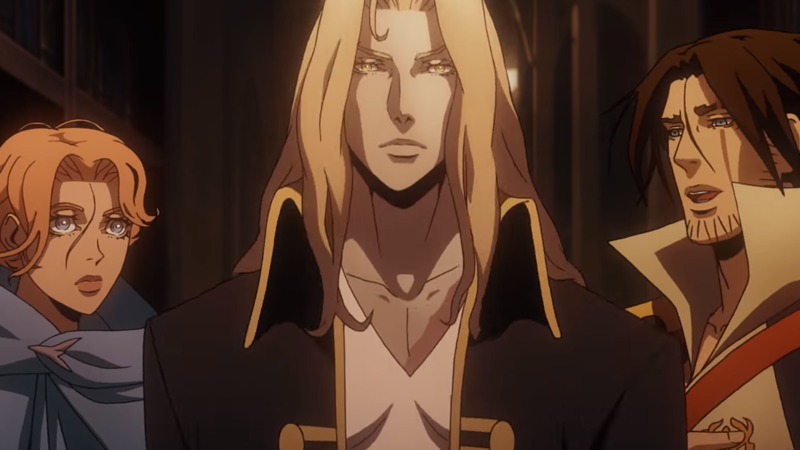 Castlevania Season 2—To the surprise of many last year, Netflix’s animated take on the iconic Konami supernatural sidescroller actually ruled— delivering a delightfully devilish and equally gory take on the adventures of the bawdiest of the Belmont vampire hunting family bloodline, Trevor. This time, Trevor and Sypha are joined by fan favorite Alucard (you’ll never guess what his name spelled backwards is!) as they quest to put a stop to Dracula’s quest for revenge. The Chilling Adventures of Sabrina—Ever since we learned that the team behind the camp delight that is the CW’s Archie Comics “adaptation” Riverdale would be turning their hand to the publisher’s incredible horror comics take on its beloved teenage witch, Sabrina Spellman, we’ve been dying to see this series. Hail Satan, indeed. Are you doing your part? You could be if you streamed Starship Troopers and saluted wildly! Flatliners—Thankfully not the awful remake from last year, but instead the 1990 original starring Kiefer Sutherland and Julia Roberts as medical students trying a deadly new experiment to see what it’s like to come back from the dead. Even if it flopped in its August dumping ground when it debuted, it’s since become a cult classic, and it’s well worth revisiting. The Man in the High Castle Season 3—Season two of Man in the High Castle got very intense, and we really can’t wait to see where season three picks up, now that the Nazis ruling alt-America have started plundering the depths of parallel worlds in a bid to maintain their dominance. Donnie Darko—Richard Kelly’s 2001 cult hit might not have aged well for some of us, but it’s still worth a watch if you’ve never seen it before. A young Jake Gyllenhaal stars as the titular character, haunted by visions of an imminent apocalypse. Lore Season 2—Aaron Mahnke’s horror podcast turned Amazon show returns for a second season of spooks. The first season took classic stories from the podcast and gave them a trippy, intriguing presentation, so we can’t wait to see more. The Blair Witch Project—A pioneer of the found-footage horror genre back in the day, time hasn’t been particularly kind to at least some of the seemingly infinite films it went on to inspire (not all of them, as you’ll seen in another of Hulu’s additions this month). But the 1999 original is still a frightful view. Galaxy Quest—No one in their right minds should ever need an excuse to yell “By Grabthar’s hammer!” out loud, but getting to stream this enduringly silly, charming tribute to Star Trek and the fans that love it is definitely one if you ever needed it. Plus, it’s something to do while we wait for the TV show to, err, eventually get made. REC—The other three REC films are also coming to Hulu this month, but the first still stands out as the best of the series, a petrifying and bold take on the found footage horror genre that’s as arguably important as Blair Witch. The Nightmare before Christmas—Is it a Halloween movie? Is it a Christmas movie? A) It’s both; B) Who cares? Nightmare before Christmas is awesome and should be streamed whenever possible. Get downright seasonal now with another trip into the wildly, gorgeously animated world of Jack Skellington and his pals, and then hey, stream it again in December for good measure. Into The Dark: THE BODY—Hulu and Blumhouse’s wild plans to launch a creepy monthly anthology series themed around holidays kicks off its year-long run with this spooky tale about a hired killer using social media and Halloween festivities to plot their latest murder. What is a Blog? A miserable little pile of Related Stories. But enough talk... have at you!